UDM Downloads > Jigs@w Puzzle Platinum Edition! Jigs@w Puzzle Platinum Edition is a truly realistic jigsaw puzzle game which has everything you need to create and play great-looking puzzles. The game provides a very comfortable puzzling environment and and superb graphics. Intricately shaped pieces have slick outlines, and bevelled edges, and cast real shadows. In this high quality game, you can create your own puzzles with optional background music. Of course you can also modify them at any time. Whilst solving a puzzle you have some help at your disposal which make solving the puzzle easier. 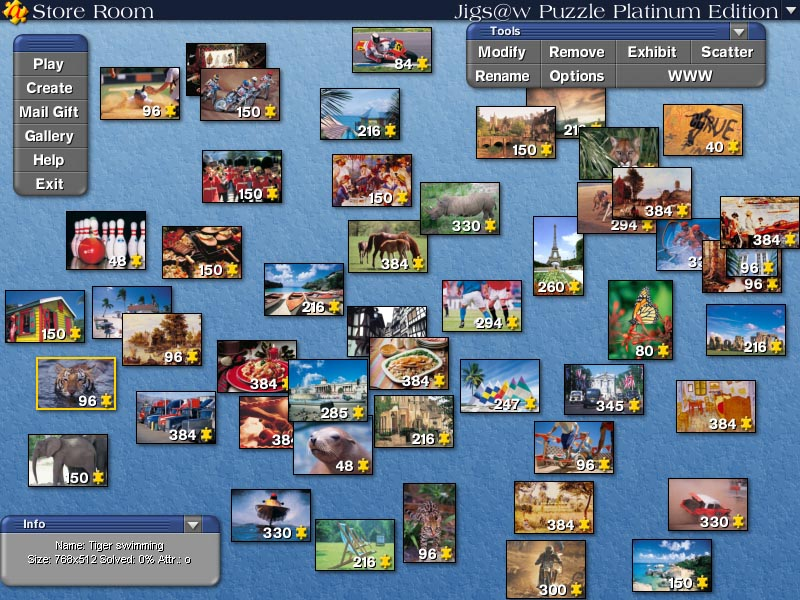 If you complete a puzzle, you can exhibit it in a 3D gallery. If you also want to please your friends, you can send them a puzzle you have created, by e-mail. The game includes 50 quality prebuilt puzzles.